If you have diabetes mellitus, your body does not use sugar properly. High blood-sugar levels can damage blood vessels in the retina. This is called diabetic retinopathy. There are two major types of diabetic retinopathy: nonproliferative diabetic retinopathy (NPDR) and proliferative diabetic retinopathy (PDR). Many diabetics have mild NPDR. NPDR is an early form of eye disease which usually does not affect vision. PDR, on the other hand, represents more advanced disease and can cause severe loss of central and peripheral vision. Diabetics who strictly control their blood-sugar levels can prevent or delay the onset of vision problems. Those who develop vision-threatening complications such as macular edema (swelling), PDR and neovascular glaucoma can be treated with laser surgery. Some patients may need multiple laser treatments over time. In advanced PDR, our practice may recommend a vitrectomy. 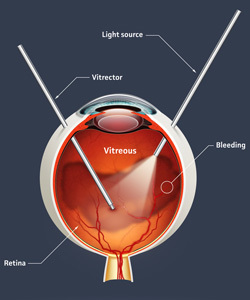 Vitrectomy is the removal of abnormal gel in the back part of the eye to control abnormal blood vessels. The earlier this surgery is performed, the better the chances of saving your vision or preventing more serious vision loss. Our specialists support the latest, most advanced diagnostic and laser treatment technology. This includes optical coherence tomography for diagnosing macular edema and digital fluorescein angiography, an imaging system that allows us to carefully analyze and treat diabetic retinopathy.